It's quite the mess the Blue Jays are making of their offseason already. 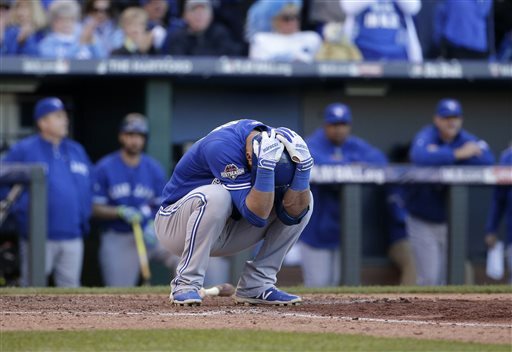 You know the story of their 2015, at least in outline: The Jays, who hadn't as much as made the playoffs since their back-to-back World Series titles in 1992-93, won the AL East title, then bounced back from a 0-2 deficit to beat Texas in the division series before finally falling to Kansas City in the ALCS. General manager Alex Anthopoulos largely built that roster. He'd held the job since 2009, reporting to team president Paul Beeston but essentially in charge of the baseball operations -- a setup akin to that in Minnesota, where Terry Ryan is under president Dave St. Peter in the organizational flow chart but in practice has the final say about the on-field product. St. Peter deals with the revenue, Ryan with the players. But that was about to change in Toronto. Beeston was retiring, and the team ownership -- Rogers Communications -- had hired Mark Shapiro, former GM and at the time team president in Cleveland, to succeed Beeston. Shapiro was reportedly telling people around the game how happy he was to get to make baseball decisions again. Anthropoulos (and manager John Gibbons) were on the final years of their contracts. The stage was set for Shapiro to do whatever he wanted -- this offseason. For this season, Beeston was still the president and Anthropoulos was still the general manager. Anthropoulos made a series of aggressive deadline trades this summer, sacrificing prospects to bring in Troy Tulowitzki, David Price and Ben Revere. Shaprio reportedly chewed him out afterwards for those trades. The Jays won the division title. Ownership offered Anthropoulos a five-year contract. He said no thanks and walked out the door. Now ... Ed Rogers, the Jays chairman (essentially their Jim Pohlad) says Anthropoulos's role would have been unchanged. The only difference would be that he would be reporting to Shapiro rather than Beeston. If, as reported earlier, Shapiro was vocally displeased with the win-now trades, that may be a meaningless distinction. All Anthropoulos will say is that the job was no longer a "fit". Shapiro takes over Monday as team president. He'll have no honeymoon; his reputation in Toronto is preset as the guy who chased out the general manager (a native Canadian, no less) who built the first Jays contender in more than two decades. And whoever makes the baseball decisions henceforth has to deal with the reality that two pieces of their postseason rotation -- Price and Marco Estrada -- are free agents this winter. Shapiro should be inheriting a good situation, but he's inheriting an unnecessary mess. Arizona Diamondbacks, will manage the San Diego Padres. For a good while on Wednesday, Internet reports -- or perhaps I should say Internet rumors, considering how it all ended -- had Ron Gardenhire getting the San Diego Padres managerial job. Late in the night, it was suddenly Rick Sofield's job. And on Thursday afternoon, the Padres held an actual press conference with their actual hire: Andy Green. Other than the obvious lines on his resume -- he's 38, hit exactly .200 in 265 major league plate appearances over four seasons, all with Arizona, bounced around the minors as a player, managed four seasons in the minors for the Diamondbacks before getting back to the majors as a coach -- I don't know anything about Green, so I'll pass on saying good hire or bad hire. San Diego's been a oddy comfy job for managers -- Bruce Bochy lasted there forever. and Bud Black held the job for more than eight years without much success -- but the new front office might be swinging the pendulum the other way. We'll see. No, the thing of interest here for me is Gardenhire. I wrote in the Monday print column that I thought the former Twins skipper a better fit for the Washington job than the Padres position, but apparently the Nats are going with Black, who checks the "major league experience" block as well as Gardenhire does and is at least reputed to be more in tune with the analytical approach to the game than Gardy is. 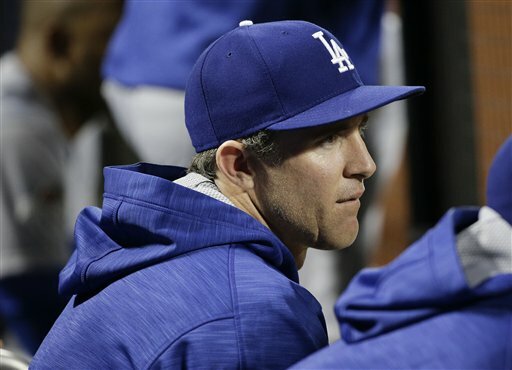 The Black hire isn't official yet, and the Dodgers and Marlins haven't made their announcements yet either, but right now it appears Gardenhire won't have a helm going into spring training. What we aren't seeing in this year's wave of hires is a strong bias for skippers who never managed on any level. Green has. Black has. Don Mattingly, who is said to be taking the Miami job, has. To be sure, Scott Servais in Seattle is a novice, so that trend hasn't died out completely, but it's not as pronounced as in the past few offseasons. Still, front offices aren't backing off their insistence that the dugout bosses use the new analytic information they are being supplied with. I suspect that, fairly or not, that's an issue for Gardenhire as he tries to land a new position. Wednesday's Game Two was prototypical Kansas City Royals, a game that demonstrated that they are fully capable of winning the series' battle of strengths. The Mets have a rotation full of high-velocity pitchers who miss bats. The Royals have a lineup full of hitters who feast on velocity and don't swing and miss. Wednesday was a case in point. Jake deGrom, the Mets starter, hit 98 on the radar guns. But even as he held the Royals scoreless for the first four innings, he induced just one swing and miss. The fifth inning saw Kansas City score four runs as the Royals peppered the Kaufmann Stadium outfield with base hits. DeGrom got only three swings-and-misses in his five innings, 2.3 percent of his pitches, the lowest rate of his career. But so far the Series has played out the way I expected. The Royals are better in the field, they're better in the bullpen, and their lineup can handle the Mets starters. Edinson Volquez started Game One on Tuesday for Kansas City, with ESPN reporting that he had learned on his way to the ballpark that his father had died earlier in the day in the Dominican and the Royals saying that he was unaware. Manager Ned Yost told reporters after the game that Volquez' family had asked that he not be told until after he had pitched. There is precedent in baseball history for World Series pitchers to take the ball in the immediate wake of their fathers' death. Two years later, in 1942, Mort Cooper went 22-7 for the St. Louis Cardinals, leading the league in wins, ERA and shutouts en route to winning the MVP award. Manager Billy Southworth elected to have Max Lanier pitch Game One, with Cooper working Game Two. Hours before that game, Cooper learned that his father had died. He and brother Walker, the Cardinals catcher, played anyway and remained with the team until the Series ended; Cooper won Game Two 4-3 with a complete game and was the starter and loser (2-0) in the series' Game Five finale. It's unclear as I write this what Volquez will do -- go immediately to the Dominican or stay with the team (he is presumably their Game Five starter). I won't think badly of either decision, and I doubt any of his teammates would either. The World Series gets started today, at long last. The Royals had the best record (95-67) in a very even American League; they have an outstanding defense, a superlative bullpen even with Greg Holland injured, and a lineup well made for its power-suppressing home grounds. 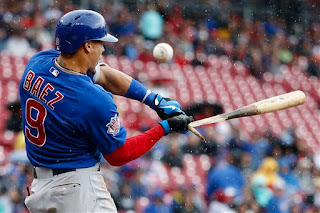 Their flaws: The rotation is below average and they don't hit many homers -- and their best power hitter, designated hitter Kendrys Morales, will probably be out of the lineup in the games at New York. The Mets' (90-72) strengths: A rotation stacked with power arms. Their lineup, which was awful in the first half, improved sharply in the second half, largely because the on-base percentages increased.They have more power than the Royals, with seven hitters in double-digits for homers. Their flaws: their middle infield is shaky defensively and they're not particularly fast. The Royals feast on fastballs. They hit .284 this year when swinging at fastballs 95 mph or higher. The Cubs were trying to jack everything into the seats against the Mets velocity; the Royals will take their singles and doubles. A lot of the Mets offense this month came off the bat of Daniel Murphy. He's not that good, and this will not continue. The Mets power will be negated in Kaufmann Stadium. Which is, frankly, a relief. The Twins had been signaling for weeks, if not months, that Hunter was welcome to return, and it was not easy to see how they could justify him as a full-time, or nearly so, outfielder in 2016. And maybe that's what led to this earlier than anticipated announcement. Late in the season, remember, Hunter had said he'd decide after the college football season (two of his sons are collegiate players). It may be that after or during the Twins organizational meetings this month Terry Ryan called Hunter and said: We'd love to have you back, but you have to understand that you're behind Hicks, Buxton and Rosario. Your playing time is going to be limited. And Hunter made the understandable decision that he's not willing to sacrifice another year to baseball if he's going to be a bit player. I'd like to think that the Twins took an honest, objective look at their talent and recognized that it was time to move on to the next generation. It's also possible that they were willing to have Buxton open the 2016 season at Triple A, keep Hunter as the primary right fielder and wait for an injury or failure to open a spot. If that was the case, Hunter just saved the Twins from themselves. 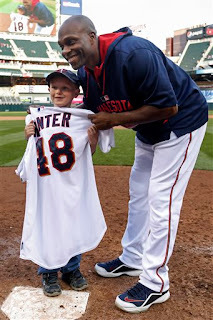 I wrote a lot about Torii Hunter in 2015, maybe too much, but he was certainly a key piece of the season for the Twins. 2016 will have a different focal point, for good or ill.
We went the weekend without baseball. The Mets wrapped up their sweep of the Cubs on Wednesday, and the Royals polished off the Blue Jays on Friday, but the World Series can't begin until Tuesday. Fox is paying big bucks to decide on what days they inflict Harold Reynolds on the public..
And, of course, even once the Series gets started, there are off days mixed in. Two games in Kansas City, an off day, three games as necessary in New York, and if the series has to return to K.C., another offday. The schedule affects the outcome. The Mets will have been sitting around almost a week, and that's not normal in baseball. It's plausible, if unprovable, that disrupting the daily rhythm of the games more than outweighs the advantage of being able to reset the pitching rotation. There was a time, long ago -- longer ago than I was around -- when the Series didn't necessarily involve the "travel days" in the middle. Back in an era when television didn't call the shots, the schedule was set according to the actual travel needs of the teams. For example: the 1926 World Series, in which the teams shifted by train between New York and St. Louis, had the now conventional setup with a day of travel between Games Two and Three and Games Five and Six. The various "Subway Series" of the 1950s, on the other hand, when the teams never left New York City, were played on consecutive days. Teams aren't wedded to rail to get from city to city now. Teams in the regular season routinely play games in the Central Time Zone today and Eastern Time Zone tomorrow. The travel days aren't genuinely for travel; they're for the network schedulers. The days off probably are good for the players, who get a chance to rest, but they also push the games deeper into the calendar, when the weather gets increasingly dicey. The most offdays there are, the better it is for the team with thinner pitching. The 2009 Yankees were a truly outstanding team -- they won 103 games in the regular season -- but because they were gifted with a postseason schedule loaded with off days, Joe Girardi was able get through all three rounds with just three starting pitchers. I'm not claiming that the delay in getting the Series started works in one particular team's favor. I am saying that it matters, and the delay has nothing to do with the practicalities of playing the games. 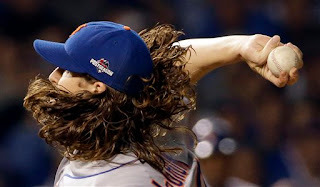 One thing for sure about this postseason: there have sure been a lot of pitchers with really long hair and really good stuff. I don't think there's a connection, but I can't pitch worth a darn and my hair, what there is of it, is quite short. That is Strat-O-Matic's depiction of Daniel Murphy's 2015 postseason so far. I'm gonna guess that even those unfamiliar with Strat can figure out what's going on there. But it's just 38 at-bats and 39 plate appearances, the very definition of small sample size. Murphy has more than 3,600 plate appearances in his career that paint a different picture of his abilities. The results of a Strat game are essentially random, literal rolls of the dice. If Jose Bautista hits more crucial homers than anybody else, it's because Jose Bautista hits more homers, period. And for many of a sabermetric bent, this is not only credible but accurate. This piece, from the FiveThirtyEight data journalism site, argues that a Murphy-like streak should happen every two years or so -- and notes that even this year, Jorge Soler of the Cubs has had a hotter postseason than Murphy. Soler's team lost to Murphy's, however, so the narrative belongs to the Murph. Every attempt I've seen to empirically study the subject of "the hot hand" concludes, in effect, that there's no such thing. A player who homered yesterday and homered again today is not more likely to homer tomorrow; he's actually less likely to do so. I think most of us intuitively realize that; it's why we're so startled with Brian Dozier hits a pair of walk-off homers in a week's time and why every Murphy four-bagger now is greeted with a mass roar of Are you kidding me? That said, I doubt hot streaks are entirely random chance. I think we've all had days when things just clicked better for us, not necessarily athletically but mentally and emotionally as well, times when our internal rhythms meshed well with the rest of the world. But maybe I just want to believe that baseball and life aren't just random. At any rate: The postseason now goes on hiatus until Wednesday for the benefit of Fox's scheduling. If ... when ... Murphy doesn't hit a home run in every game of the World Series against Kansas City, there will be chatter that the break cooled him off. An alternative interpretation would be that he was destined to return to being Daniel Murphy. It's just not realistic to expect him to slug 1.026 indefinitely. The NLCS is over; the Mets dominated that series, never trailing for even an out. I predicted here that the Mets would win; I certainly didn't expect it to come that easily. But even though I think Toronto has the advantage of the pitching matchups, the home field reality remains. They are a team of right-handed sluggers, even more so now than in the regular season with Chris Colabello having pushed Justin Smoak aside at first base. The Kansas City stadium is not a place where sluggers thrive. Pitching, defense and three-run homers -- the Earl Weaver formula -- is usually a formidable combination. But when the three-run homer isn't something you can rely on, the formula breaks down. Which is why I return to what I said before the series began: I am rooting for the Jays, and I think the Royals will win. On the same day that the New York Mets completed their sweep of the Chicago Cubs and the Toronto Blue Jays staved off elimination, the Twins made their first roster moves of the offseason: They outrighted catcher Eric Fryer, outfielder Shane Robinson and left-handed pitcher Aaron Thompson. This takes all three off the 40-man roster. All three are likely to test free agency, and I doubt any of them will find a team willing to offer a major league contract. I rather expect the Twins to offer them minor league deals, Fryer in particular. Robinson might be the least likely for them to retain; he's a fourth (or fifth) outfielder on a team with a lot of young outfield talent. The Twins ended the season with a full 40. They have, according to Mike Bearadino, five pending free agents (I believe they are Blaine Boyer, Neil Cotts, Brian Duensing, Torii Hunter and Mike Pelfrey), and they come off the roster after the World Series. They also have Ryan Pressly and Logan Darnell on the 60-day disabled list, and they will either be restored to the 40 next month or go through waivers; I would expect the Twins to keep both. So I make the effective 40 to be at 36. Expect some more deletions in the next few days. Berardino listed six prospects who will be Rule 5 eligible this winter, and there isn't enough room to add them all now. One thing is certain: The Twins have the opportunity, again, to overhaul their bullpen corps this winter, especially the left-handers. Daniel Murphy, second baseman for the New York Mets, certainly picked a great time to do his Babe Ruth impersonation. Murphy has hit six homers in 12 days, including long balls off Zach Greinke, Clayton Kershaw, Jon Lester and Jake Arrieta. Quite the performance. In 2012, he had more than 600 plate appearances and hit six homers all year. And now this -- propelling the Mets to the brink of the World Series and propelling himself into free agency on a high note. Every day seems to bring higher speculation about how much Murphy will get this winter. And the skeptic in me whispers: Don't be so sure. George Steinbrenner is dead, and front offices are smarter than they were a decade ago. Murphy is a good hitter for a second baseman, and a below average fielder. The combination makes him, over time, a marginal regular. And he's 30 now, set for his decline phase. It's irrational to believe October 2015 overrides his first seven years as a measure of his ability. Maybe there is still a greater fool out there who will pay him on the basis of this postseason, but I doubt it. Liam Hendricks had, from all appearances, a very strong season for the Toronto Blue Jays: 5-0, 2.92, with 71 strikeouts and 11 walks in 64 innings over 58 appearances, He spent the whole season in the majors. Yet it's quite obvious that Toronto manager John Gibbons doesn't really trust the Aussie. The primary righties to bridge the gap between the starters and closer Roberto Osuna are Mark Lowe and Aaron Sanchez, neither of whom have the raw stats in 2015 that Hendriks does. 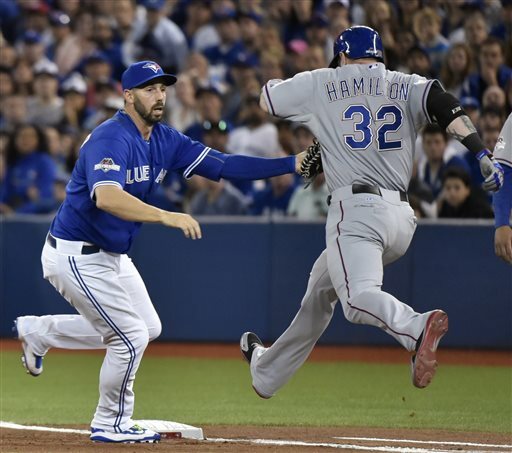 Hendriks made his first appearance in the ALCS Monday night, coming in for the ninth inning with a seven-run lead. He faced four hitters, three of whom got hits and the other a hard-hit out, and was pulled for Osuna. As it turns out, spelunking into the numbers, Hendriks built his impressive overall stats in situations that didn't matter much. According to Baseball Reference, Hendriks faced just 39 hitters all season in "high leverage" situations; those hitters hit .359. Hendriks faced 40 hitters in "medium leverage" situations; those hitters hit .389. And he faced 181 men in "low leverage" situations; those hitters hit just .176. He had six holds on the season, none after August 5. Is that random chance at work or something intrinsic in Hendriks' skill set or psyche? The stat nerd in me says it's baseball's randomness. But I am reminded of Anthony Swarzak, who spent a few years in the Twins bullpen thriving in low-importance situations and struggling when the hitters mattered in games. Put Swarzak in six runs down, and he'd likely provide a couple shutout innings; put him in in a tied game, and he'd likely yield one or or more runs. I was frequently critical of the Twins handling of Hendriks. They bounced him between majors and minors for three years and, in my estimation, never gave him a clear shot at the rotation. He had 28 starts in his 30 appearances with the Twins, and I'm not foolish enough to say he pitched well in those starts (his Minnesota ERA was 6.06), but a lot of successful major league starters floundered in their first 30 or so starts. It's not like the 2012 or '13 Twins had a lot of obviously better options, or couldn't afford to sacrifice some games to developing Hendriks. Anyway: The Twins gave up on him as a starter and didn't think him worth trying as a reliever. His 2015 numbers say that was a mistake. His 2015 usage suggests it doesn't matter. He's only 26; we'll see how and if his impact develops. 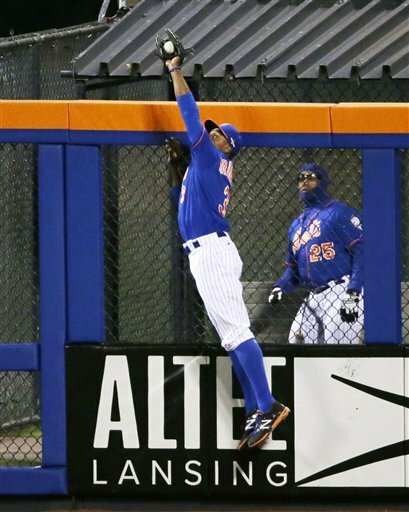 The Grandy Man can ... make this catch. Away back in 2001 -- in the early days of Mankato's entry in the Northwoods League -- the Mashers (which eventually morphed into the MoonDogs under new ownership) featured an outfielder named Curtis Granderson. That connection has given some of us in the Key City a lasting interest in Granderson's career. On Sunday night, he started the Mets' three-run first inning rally against the seemingly impregnable Jake Arrieta. He later reached over the right field wall to take a homer away from Chris Coghlin. He also drew a walk, stole two bases and scored a second run. Nice game. Four players in baseball history have hit 40 homers in a season and 20 triples in a season (not in same season). Name 'em. Answer: Lou Gehrig, Rogers Hornsby, Willie Mays and, yes, Curtis Granderson. Three of those names are inner-circle Hall-of-Famers, and the fourth is Granderson. But Granderson, now in his mid-30s, has certainly had a distinguished career. even if his production takes different shapes with different clubs. He's had four 100-run seasons and two 100-RBI seasons, he's hit .300 (only once), he's had a couple of 25-steal years. He's not a classic leadoff man, but he got the job done in that role with the Tigers and he's doing it again now for the Mets. He's always been pretty ineffective against left-handed pitching, and that remains the case (.183 against southpaws this year). Saturday's game in Kansas City. I know, and you know, that the real pic of the week in baseball -- probably the pic of the year -- is the same guy throwing his bat aside after a game-breaking homer in Game Five of the division series. But I used that one already. So here is Jose Bautista in a decidedly non-triumphant moment. As I write and post this, the Kansas City Royals have a 2-0 lead in the best of seven series. But now the ALCS moves to Toronto, and this series matches a pair of teams emphatically crafted to fit their home arena. The Royals are speed, contact hitters, outstanding defense; the Blue Jays lineup is one power hitter after another. The Kansas City stadium discourages the long ball; Toronto's retractable dome rewards it. The Jays are down. They are not out. About two months ago there was plenty of Minnesota chatter about Miguel Sano as Rookie of the Year. That chatter waned with his September production (.241/.364/.435). As it turns out, Sano didn't even make Baseball America's All-Rookie Team. BA used the DH slot to get Carlos Correa on the team, and Correa's not at short because of Francisco Lindor. (A third rookie shortstop, Addison Russell, was listed at second base.) And of course, third base went to Kris Bryant. Nor did Eddie Rosario or Trevor May or Tyler Duffey make the mythical BA squad. There were simply a lot of very good rookies breaking in this year. Bryant is certain to be named the National League Rookie of the Year. The AL award figures to be a close vote between Correa and Lindor. I'd go with Correa, but there's no way to say a Lindor voter is wrong, They're both terrific players. Nor does the exclusion of the four Twins demean their seasons or futures. There were simply other rookie outfielders and pitchers who had better major league seasons. All told, a pretty solid postseason so far. Three of the four divisional series went the five-game distance; we had a first-class controversy in the Chase Utley takeout/suspension; and we had an iconic moment from Jose Batista that will be part of MLB promos for the rest of my life. And, let us not forget, we've seen some power arms in starting rotations. Serious stuff, man. Kudos to the New York Mets, who managed to win their series from the Dodgers despite facing Clayton Kershaw or Zach Greinke in four of the five games. But maybe it's not that surprising, the Mets surviving and advancing, considering the quality of all four of their starters. DeGrom, Snydergaard, Harvey, Matz -- like I said, serious stuff, man. Add in Jake Arrieta and Jon Lester of the Cubs and Garrit Cole of Pittsburgh, and it's clear the NL field in particular was bringing the heat. Those teams, those rotations, are in the National League, so the Twins are not in direct competition with them. But it jumps out at me that the Twins rotation is stocked with middle-to-back filler. Ask yourself who, if anybody, the Mets would bump from their rotation for Ervin Santana. Kansas City, of course thrives with a mediocre rotation/ It's not essential to have multiple starters of that quality-- as long as the rest of the team is good enough in the field and in the bullpen to support a collection of inning eaters. The Royals are, The Twins aren't. The Toronto-K.C. series is intriguing. The Blue Jays thrive on their thunder; the Royals have more power than they have in the past, but their game remains based on contact hitting and speed. Of note in this series is that the Royals don't have a left-handed starter (as was the case last October, Danny Duffy is working as a reliever.) Usually that lack of balance is a negative; in this series, it's a plus, because Toronto is so right-handed. I'm rooting for the Blue Jays; I fear the Royals will win. In the National League, the Cubs seem pretty clearly the superior team to the Mets. Superiority doesn't mean a lot in a short series, however, and my gut is picking the Mets. Jose Batista and the bat flip to end all bat flips. 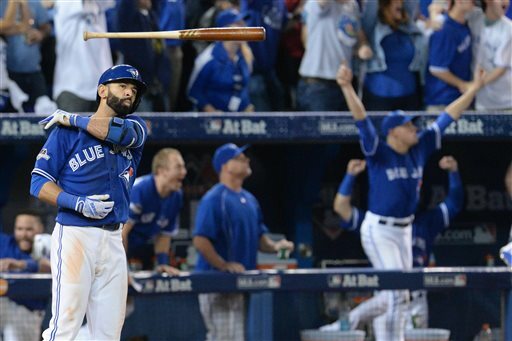 An inning that epic deserved a bat flip that epic. I am 57, and have been obsessed with baseball for the vast majority of those years. I don't think I've seen, or could imagine -- much less describe -- the fury, the passion, the emotion of the 53 minutes of the seventh inning of Wednesday's Rangers-Blue Jays game. It wasn't great baseball. But ain't baseball great? Well, maybe not right now if you are Texas shortstop Elvis Andrus, who committed two errors in the seventh inning and couldn't bail his first baseman out of another. Andrus carries the reputation of a high-quality shortstop. He wasn't in the seventh inning. Maybe not, also, if you are Dale Scott, the umpiring crew chief and home plate ump for the fifth and decisive game of the division series. Scott's errant time-out call after Russell Martin's routine return throw to the pitcher bounced off the bat of Shin-Soo Choo turned an odd play bizarre. led to the Jays playing the game under protest and played a role in turning the big Toronto crowd ugly. But then there was Jose Batista and his glorious moment. A fat fastball from Sam Dyson. Joey Bats living up to his nickname -- and then standing, glare-faced, at the plate as the ball sailed to the second deck in left center before flinging the bat in the direction of the Texas dugout. Maybe you're rooting for the Blue Jays in this postseason (I am, in large part for the sheer number of former Twins on the roster), Maybe you aren't. But if you watched that bizarre inning and thought Batista was out of line, I feel a bit sorry for you. If the Rangers are sore, I have this response: Catch the darn ball. They gave Toronto five outs in the inning. That's what should embarrass the Rangers, not Batista's flung implement. Ron Gardenhire isn't going to be the Detroit Tigers manager, notwithstanding last month's Internet rumors. 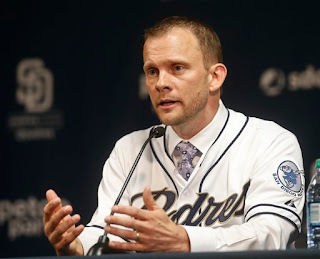 But he apparently will be interviewed by the San Diego Padres and Washington Nationals for their vacancies. My sense of those organizations is that Gardy is probably too old-school for the Padres' new-wave front office. The Nationals, on the other hand, appear to want an old-school manager, and after two years of first-time skipper Matt Williams, emphatically crave experience. Which is the better job? Well, the Nats have the best player in the league in Bryce Harper, and even if Jordan Zimmermann leaves as a free agent, the rotation will still feature Max Scherzer and Stephen Strasburg. There's going to be considerable turnover on the Washington roster, but there will be enough there to justify an expectation of winning now. The Washington job also comes with the sizable shadow of the end-of-the-season scuffle between Harper and Jonathan Papelbon. Whoever gets that job will have to deal with some sizable egos and ... personalities. I've been a bit skeptical of Gardenhire's chances of landing a second managerial job; teams have been downplaying retreads in favor of novice managers, which I believe is a direct result of front offices wanting skippers who will use the new world of information. That is probably not one of Gardenhire's selling points. But the Nationals appear to be in the market for what Gardy does offer -- a dugout boss who's been there. division series from the dugout. Chase Utley was suspended Sunday for Saturday's excessive and injurious takeout of Mets shortstop Ruben Tejada. He appealed the suspension and was, as is typical of baseball suspensions, eligible to play in Monday's game. I wrote about the Saturday play here and expanded upon that post in the Monday print column. But while I think Utley's play was dangerous and, by the rulebook description, illegal, I can't see that the suspension is warranted. Both in the itself and the rulebook commentary emphasize the umpire's judgment. In practice, umpires have chosen not to exercise that judgment. In practice, umps will only make that call if the baserunner assaults the infielder with a tire iron. The umpire, Chris Guccione, followed the tradition, which is why Utley's defenders can legitimately say it was a legal play. I may be taking an overly lawyerly approach to this, but I can't see how the suspension can stand up. I also don't think making Utley actually miss games is necessarily the point. Whether Utley takes the field again or not, Joe Torre has now put the umpires on notice: Enforce Rule 5.09 (a)(13). The issuance of the suspension effectively tells Guccione and the his brethren that his judgment on the the play was wrong. And it warns baserunners not to repeat what Utley did. I fully expect that Rule 5.09(a)(13) will be revised this winter, with expanded commentary and less emphasis on the judgment of the umpire. Whether it is or not, stricter enforcement of 5.09(a)(13) is overdue and perhaps sufficient to cool off the aggressive basecrashers. and he's still pitching in the majors -- for now. 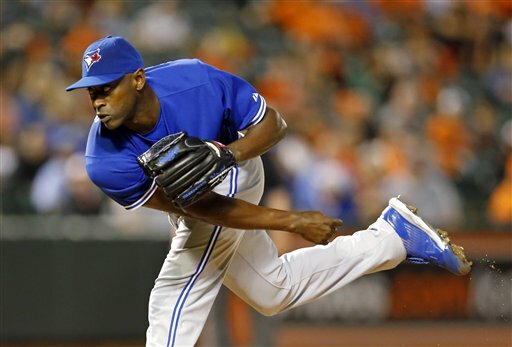 LaTroy Hawkins intends this to be his final major league season. Here's hoping his last appearance isn't Friday's loss in the division series. Hawkins is, apparently, one of the last men in the Toronto bullpen. (So too is fellow former Twins Liam Hendriks, of whom I may blog as the postseason progresses.) The Hawk didn't get into Friday's game until the 14th inning, when he yielded three hits and two runs in two-thirds of an inning and was saddled with the loss. The Hawk is 42 and has been in the majors for 21 seasons, His 1,042 appearances ranks 10th on the all-time list; should he renege on his retirement plans and duplicate this season's 42 games pitched, he'd climb into the top five all time. It's an intriguing career. Longevity is usually related to quality, but Hawkins has a modest career record of 75-94, 4.31. The only category he ever led the league in was earned runs allowed (129 in 1999). To be sure, that record is tainted by the Twins' persistent attempts in the 1990s to find a starting pitcher in his talent; his ERA in his 98 career starts was 6.11. Hawkins has said that he thanks God everyday for Tom Kelly, who made him a relief pitcher, but it was also Kelly who ran him out for all 98 of those starts. Obviously, Hawkins thrived in the bullpen. He had a few scattered seasons in which he found himself closing, but for most of his career he was a seventh-inning guy -- a set-up man, and not even the top option. He pitched for 11 teams in his 21 seasons, with nine years in Minnesota. Once he left the Twins as a free agent, he was a wandering arm for hire. Baseball Reference estimates that he's made more than $47 million in his major league career. Nice work if you can get it and keep it. For more than two decades, Hawkins has always found somebody willing to pay him to fill out the pitching staff. fractured his leg on this play Friday night. Let's call this was it was: A rolling block by Chase Utley. It was not a slide; nothing but his feet touched the ground between leaving first base and undercutting the leaping Tejada. This sort of no-slide bodyblock of infielders was routine in the days of Frank Robinson and Hal McRae. Eventually a rule was put in to allow the umpire to call a double play if the baserunner made no effort to touch the base. Utley never touched the base, so he clearly made no such effort. That rule is seldom invoked. It should have been in this case, but the umpiring crew, and specifically second base umpire Chris Guccione, lacked the, let us say, courage to make that call. Not that making the interference call would heal Tejada's leg. This play comes a few weeks after a similar late slide by the Cubs' Chris Coghlan broke the leg of Pittsburgh infielder Jung Ho Kang. Utley's block, even in the context of ''gotta break up the double play," was probably unnecessary. 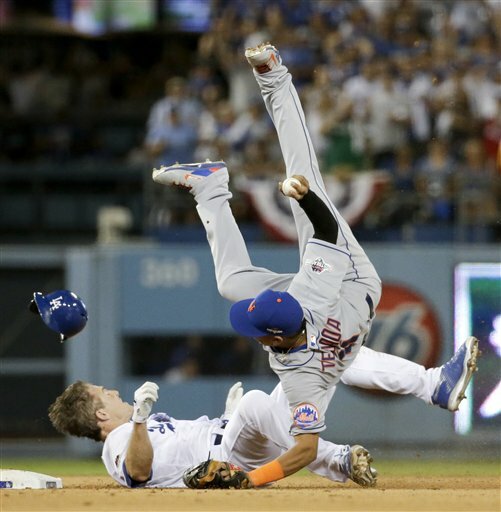 I don't think Tejada could have gotten the double play had Utley simply slid into the base. There are differing opinions on whether it was a dirty play. I think it was. Utley was wrong. The umps were wrong. And I sincerely hope that MLB, which has largely cleaned up the home plate collisions, will tighten the rules on force play slides. If you hit the infielder, you've got to touch the base as well, or have the DP called automatically. No judgment required. The Toronto Blue Jays could almost be described as "Twins Canada." The roster includes Ben Revere, who has played left field and led off in both playoff games; starting pitcher R.A. Dickey; bullpen arms Liam Hendriks and LaTroy Hawkins; and Chris Colabello, first baseman-outfielder and right-handed bat. All are former Twins. Colabello is pushing 32 now. He's been a long time waiting for his shot, and his best opportunity with the Twins went awry in 2014 when he injured his thumb and tried to play through it. The Twins let him go, He landed with Toronto, made the roster out of spring training, and was playing a lot of outfield for the Jays when the Twins first saw them in May. Colabello is miscast as an outfielder, and when the Jays acquired Revere from the Phillies in July Colabello lost most of that portion of his playing time. Revere and Colabello are pretty much opposite players. Revere is small, speedy, left-handed, a singles hitter; Colabello is big, slow, right-handed, a power threat. Playing Revere over Colabello is about the Jays needing his specific skill set. Before the All-Star Game, Colabello had 221 plate appearances and hit .325/.371/.500, a very strong slash line. After the All-Star Game, his playing time fell off (139 PA) but his production did not (.315/.360/.551). The Jays didn't have to reduce Colabello's playing time to get Revere into the lineup. They could have made him the first baseman. Instead he splits playing time with Justin Smoak, who hit .226/.299/.470. Even granting that Smoak is a better defensive first baseman, it's difficult to see that his glove makes up for the hitting difference. But the core of the Jays lineup is heavily right handed. Josh Donaldson, Jose Batista, Edwin Encarncion, Troy Tulowitzki, Russell Martin -- all right handed. Smoak is a switch hitter, so he gives the Jays a left-handed stick with some power to balance out the right-handed sluggers. It's the skill set issue again. Colabello is a right-handed slugger on a team with a surplus of right-handed sluggers, and that limits him now to a platoon role. McCarthy's ire was raised by the FS1 studio crew. and specifically Pete Rose, who twice went on rants about Josh Donaldson's coming out of the Rangers-Blue Jays game after being kneed in the head. The Donaldson play itself -- I'm not going to waste a lot of sympathy on him. He went in late and high. He got a knee in the head from a leaping infielder because he was sliding to make hard contact. He got what he was looking for. Donaldson is a likely MVP, and I'm rooting for Toronto in this series, and if he is concussed it's going to hurt the Blue Jays, but it's his own fault. But the FS1 broadcasters Thursday were pretty poor. There is a lot of overlap these days between the various Fox baseball productions and MLB TV, and I'm not sure who exactly deserves the blame or credit for various aspects, but Harold Reynolds is emphatically MLB TV's fault nowadays, and I find him unlistenable. The sound was off for my viewing by the second inning of the afternoon game. One thing I will give FS1 credit for: the graphics to illustrate the infield shifts were good and informative: different colors for each of the infielders showing the traditional positioning and where the infielder was actually playing. I've not seen that used before, and it's particularly useful on those shifts in which the shortstop remains on on the left side but the third baseman has moved to the other side of second base. But really, FS1 has to be able to find announcers who, if they want to criticize sabermetrics, at least know what it is they're ripping. A.J. Pierzynski and John Smoltz don't, and said so. Specifically, they were questioning the preseason predictions of the Royals. How can you predict a team with this rotation and this deep lineup to win 70-some games? Well, because Kendrys Morales and Mike Moustakas drastically outperformed any reasonable expectation. Because the Royals rotation really is NOT good (by Baseball Reference's version of WAR, it was the third worst starting staff in the American League). Because when those predictions were made, Ben Zobrist was an Oakland Athletic, not a Kansas City Royal. Because while Alex Gordon was indeed hitting eighth Thursday night, that's because manager Ned Yost insists on hitting Alcedes Escobar and his sub-.300 on-base percentage leadoff, not because the Royals have a truly deep lineup. Hey, Morales and Moustakas had really good years. But if Moustakas had hit at the .641 OPS he did in 2013-14 instead of the .817 he did this year -- and if Morales had hit at the .612 OPS he did last year after his sustained holdout -- the Royals lineup would be the freaking disaster the metrics predicted. One problem with three-man booths is that there are too many voices. I had the sense that the play-by-play guy knew the rationale for the predictions, but he's got the action to call, and he's supposed to be directing traffic, not arguing with ignorants. And later, we saw a problem with using current players (Pierzynski) in the booth. Late in the game there was cause for criticism of an umpire, and Pierzynski begged off because he didn't want to make any umpires unhappy. The Pittsburgh Pirates won 98 games. The Chicago Cubs won 97. These are the second- and third-best win totals in baseball this year, but they were in the same division as the St. Louis Cardinals, who won 100, so they wound up in the wild card game. Jake Arrieta pitched Wednesday night as he has for a few months now, which is to say about as well as anybody possibly can, so the Cubs won and move on to face ... the Cardinals. You don't have to look very hard to find people who think the one-and-done format is unfair to the wild card entries. I'm not in that camp. If the Pirates and Cubs wanted to avoid that game (and they did), they needed to win their division. The Pirates had losing records against both the Reds and the Brewers. Turn that around, and it would have been the Cardinals playing the Cubs. The Pirates may well a better team than either the Dodgers or Mets, but their better won-loss record in and of itself doesn't necessarily prove that. The fact is, with unbalanced schedules and variations on interleague play, teams in the same league aren't playing anything close to the same schedule. And treating the Pirates as equal to the division winners is emphatically unfair to the division winners, who -- you know -- finished first. This format isn't as good at rewarding quality as the pre-division practice of "best record goes to the World Series," but that era isn't returning. I'm old, and my fandom doesn't extend to the days before divisions. This format does give more weight to the regular season than did the previous one-wild card system. Most years in most leagues, this format is going to wind up with something closer to the American League wild card entries -- two teams that aren't exactly medicore but flawed. The 2015 National League is atypical. There was only one genuine divisional race and five teams well ahead of the other 10. Terry Ryan on Tuesday had a media session Tuesday heading into the organizational meetings that start later this week in Fort Myers. The consensus on Twitter was that there was no big news coming out of it but a few tidbits were informational. No surgeries are planned, but Brian Dozier is to have an MRI on his hip. The coaching staff is expected to return en masse, although contracts have yet to be finalized. Trevor Plouffe and Joe Mauer won't be changing positions, and Ryan doesn't want Miguel Sano pigeonholed as a designated hitter. The irrational grief Mauer takes on talk radio and social media obscures reality. He isn't the .330/.400/.500 hitter of his 20s. But his OBP still plays in the upper half of the batting order. Both Mauer and Plouffe were, by OPS+, slightly below league average at the plate but considerably better than, say, Torii Hunter. Neither was as good at hitting as Sano, whose time in the field was limited by hamstring issues. There is only a problem here for the Twins if they make it one. They have three corner infielders, each of whom still has a useful role in the lineup, and three positions to play them (first base, third base and designated hitter). This isn't a true logjam. There's a fallacy that the Twins have fallen into before, notably with David Ortiz: So-and-so is "too young" to be a designated hitter. This is not unique to the Twins, of course; most notably, the Seattle Mariners wasted a sizable chuck of Edgar Martinez' career because he had no defensive position. He had to get into his late 20s before the M's let him do what he was born to do. The Twins want Sano to work on his defense, and one piece of that may well be that he will have to hold his weight down if he's playing in the field. Another is that they'll want him in the lineup for interleague road games. But the core reality is this: The 2016 Twins, barring trade or injury, figure to have Mauer, Sano and Plouffe in the middle of the lineup, and the best defensive alignment of the trio has Sano as the designated hitter. CC Sabathia at age 35 isn't the stud hoss top-of-the-rotation pitcher he once was, but he still led the Yankees in starts and innings pitched this year. He was going to be part of their postseason rotation. Note the past tense. On Monday Sabathia announced he was out for the postseason and checked into inpatient rehab for alcoholism. It is to the Yankees credit that both Brian Cashman and Joe Girardi are vocally supporting Sabathia in this. The cynic in me whispers that they might not be so accepting if Sabathia's ERA were 2.73 rather than 4.73, but I am telling my inner cynic to shut up. This is the way workplaces ought to deal with illness, and alcoholism is an illness. The timing is interesting, however. I will seldom -- I am tempted to say never -- question the competitive desire of a professional athlete, and particularly one who has the track record of Sabathia. Yet, for whatever reason, he has chosen the start of the postseason to enter treatment. This suggests to me that he's hit some sort of crisis point. I don't know what that would be. There has been no revelation of some sort of trauma -- a DUI, a domestic call, a barroom brawl -- that might trigger a sudden acceptance of a problem. Whatever happened to prompt Monday's announcement, I wish Sabathia well in dealing with his problem. This is different from wishing him, or the Yankees, well on the field. There I hope, always, that they lose. The final out of the regular season necessarily comes every year and is always predictably depressing. The playoffs and World Series are well and good, but I embrace baseball's daily grind, the highs and the lows and the background knowledge that it all adds up and none of it is all that crucial by itself. This is why novelists have long used the baseball season as a metaphor for life. So another Twins season is dead, and another will be born next February in Fort Myers, Florida, and transplanted in April. The 2015 version will be remembered in the long run not so much for the failure of the team to reach the playoffs as for launching the big league careers of Miguel Sano and Byron Buxton and Eddie Rosario and maybe Tyler Duffey. And maybe as the end for Torii Hunter. Or maybe not. Hunter was coy Saturday and Sunday about his immediate plans, He'll decide after seeing his sons play out their college football seasons in November. Or he'll decide in January after ramping up his workouts. I take him at his word when he says he doesn't know if he'll play next year, and when he says that if he does, it will be nowhere but Minnesota. He's 40, and he knows it. In April he tried a straight steal of home; by September he was being pinch-run for on a regular basis. He sees Buxton and Rosario and Aaron Hicks and Max Kepler, all young enough to be his sons, all dripping with talent and all crowding for outfield playing time. Hunter hit 22 homers this year, but in all other aspects, it was his worst season at the plate since 2000. I have said this many times about many other players: I don't begrudge a player for wanting to squeeze one more year out of his career. The Jason Bartlett fiasco of 2014 wasn't Bartlett's fault, it was the fault of a manager and front office that couldn't, or refused to, see in spring training what everybody else did -- Bartlett couldn't play major league ball any more. Should Hunter return? There seems to be a consensus among the writers that he will do so only if he's promised that he will still be a lineup fixture. That would be a foolish promise for the Twins to make, but they might make it anyway. It wouldn't be the first time they let sentiment get in their way. in the fifth inning Thursday. There are certain kinds of images that strike me each summer. A pitcher with his arm twisted into an improbable, if not impossible, position. A vivid sunset beyond the outfield fence. A section of fans reacting to a foul ball. The long shadows of late August and September. And a bat being shattered. Like this one. Friday's game, in and of itself, was just 1/162nd of the long season. Added to the previous 159/162nds of the long season, Friday -- a Twins loss combined with wins by the Angels and Astros -- pretty much concluded the Twins unlikely playoff dreams. One tenth of one percent. In terms of batting average, .010. Dean Chance was a legendarily poor hitting pitcher for the Twins and Angels back in the 1960s, and he hit better than that. But .010 is better than .000, and the Twins will give their remarkable resilience another go today. Two crucial differences: Kelly was managing with the lead, while Molitor is playing catch-up; and Kelly had two horses, Frank Viola and Bert Blyleven, who each threw more than 250 innings with markedly better-than-league ERAs. Molitor has no such rotation foundation. The best he has is Kyle Gibson, who might start Sunday's scheduled finale on three days rest. If he does, he has a chance to top 200 innings (he's at 194.2 now). Gibson's ERA right now is slightly better than Blyleven's in 1987, but his ERA+ (ERA adjusted to league and park environment) is a good bit worse (eight percent better than league average compared to Blyleven's 15). And, of course, there's Tyler Duffey, the rookie sensation who started Thursday night and took a shutout into the seventh inning before giving up a two-run homer. Duffey has thrown now 58 innings in 10 major league starts (ERA 3.10), and he's also worked 138 innings in the minors for a total of 196. The Twins -- one game out of the second wild-card spot and tied with the Angels with three games left on the schedule -- will start Ervin Santana tonight against the Royals. Tommy Milone figures to start Saturday, and I expect Gibson will get the ball if Sunday's game means anything. And if a Game 163 is needed Monday? By the rotation, it would figure to be Mike Pelfrey, who is second on the team in starts and innings. But I can't imagine anybody has much faith in Big Pelf at this point. Molitor may well give the ball to Phil Hughes under that scenario, with Duffey pitching Tuesday on regular rest if the Twins are still alive. I can't imagine Molitor having Duffey go on three days rest. Once past a Game 163 (or 164 in a more extreme tie-breaking scenario), Santana would be out of the picture. His PED suspension kicks back in for the postseason. Presumably the playoff starters would be some combination of Gibson, Duffey, Milone and either Hughes or Pelfrey. We can wait to wrestle with that problem until it actually arrives. All in all, Thursday wasn't a horrid day for the Twins. They actually gained a half-game on that second wild-card spot despite never really being in the second game of the rain-caused doubleheader. But Ricky Nolasco pitched. This impresses me. It would have been easy for him to shut down his season after his foot surgery. Instead, he pushed his rehab and got back on the hill. Nolasco has said a few things the past couple of years that gave some the impression that he doesn't care. Getting back this year says otherwise. He threw two innings of mopup work, allowed two hits, granted an intentional walk and struck out five. Not bad, all things considered, even with the three-run homer. But ... his, and the Twins', reaction to that homer was tired (to borrow the description from Bryce Harper). The Twins were down 7-1, and Paul Molitor had Nolasco walk Jason Kipnis intentionally. The next hitter, Jose Ramirez, homered, and flipped his bat rather epically. Aw, did Ramirez hurt the Twins feelings? Make your pitches and he's got nothing to flip his bat over. Seriously. The Twins spent eight innings embarrassing themselves with sloppy play and they're worked up over a guy celebrating a homer after they walked the man in front of him? Grow up. No team with Torii Hunter on the roster has any right to gripe about bat flipping. And if they spend any pitches Thursday throwing at Ramirez in retaliation, they don't deserve a playoff berth.